Regalis forages for wild edibles year round. Below is a list of wild foraged American edibles that Regalis Foods carries when they are in season. *Sumac: When life doesn’t give you lemons, use sumac. This bright, deep fiery red berried plant hits its peak during early to mid-Autumn, when the juicy berries are ripened to perfection, lending a tart, lemon profile and beautiful appearance to just about any dish. The seeds may be dried, ground, and used as a spice, most commonly found in Middle Eastern cuisine. *Japanese Knotweed: An important source of nectar to bees throughout the United States, the flowering yellow buds of Japanese knotweed are a wonderfully perfumed garnish, or addition to teas, sauces and infusions. *PawPaw Fruit: The largest edible fruit native to America, the pawpaw has been the beloved treat to folk like Thomas Jefferson and Lewis and Clark during their journeys throughout the country. Growing in the wild in over twenty one states, the pawpaw tastes like a cross between the best banana and mango you’ve ever tasted. With its custard like texture, all you need is a spoon. *Ginseng: Native to North America and Eastern Asia, wild ginseng is known for its incredible healing properties, from reviving the body with more energy, aiding in stress and chronic fatigue syndrome, the common cold, depression, anxiety, heart protection, and some say it even delays the effects of aging. 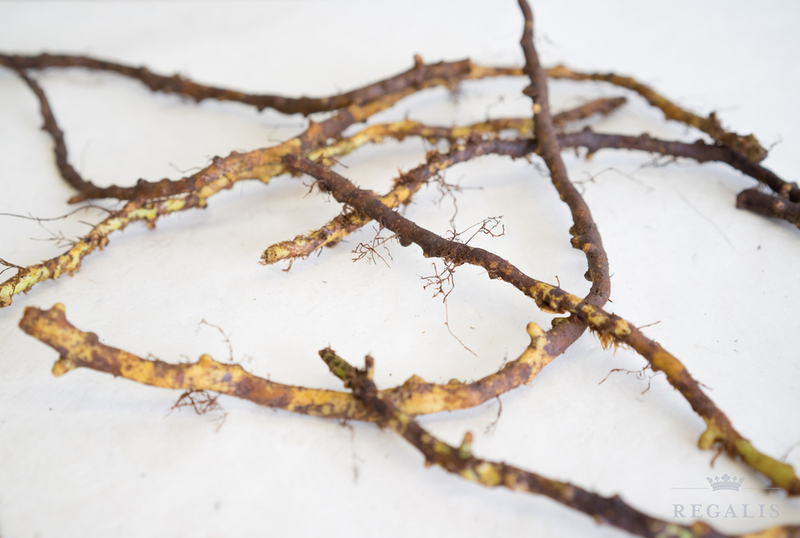 We work with a selective group of foragers from upstate New York to provide you with the freshest ginseng root when it’s in season. We’ve also got dried ginseng for those months when it’s out of season. *Spice bush berries: Named for the aromatic, spicy scent that arises from its leaves, flowers, bark and fruit, the spicebush has been used for many purposes including teas, food flavorings, and medicines for centuries. A flavor profile similar to allspice and nutmeg, this aromatic berry is perfect for baking, infusions and more. *Pine Buds: The bright green buds bloom in spring time. 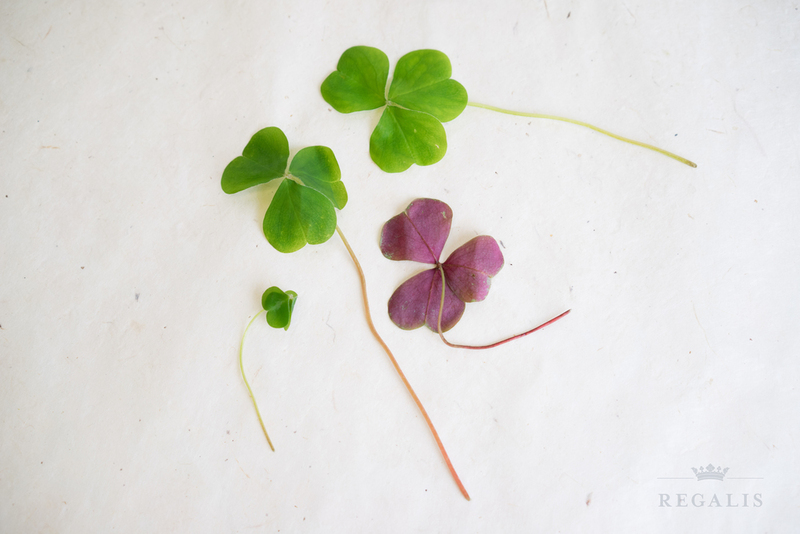 Best eaten raw or boiled, these tiny gems capture the essence of the forest. *Huckleberry: One of the oldest North American wild berries, the huckleberry is a wild berry with a deep indigo purple hue and tart, aromatically floral flavor profile. The favorite amongst Michelin star chefs and black bears alike, this wonder fruit has a wide array of applications. 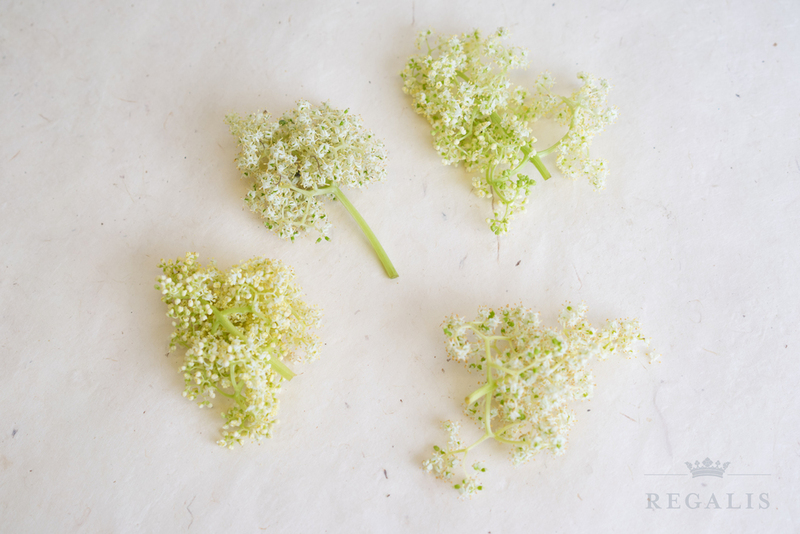 *Elderflower Blossom: The light yellow flower blossoms of the elderflower shrub are used in a wide array of culinary applications which include elderflower champagne, steeping in teas and used as an ice cream base for an aromatically floral dessert. 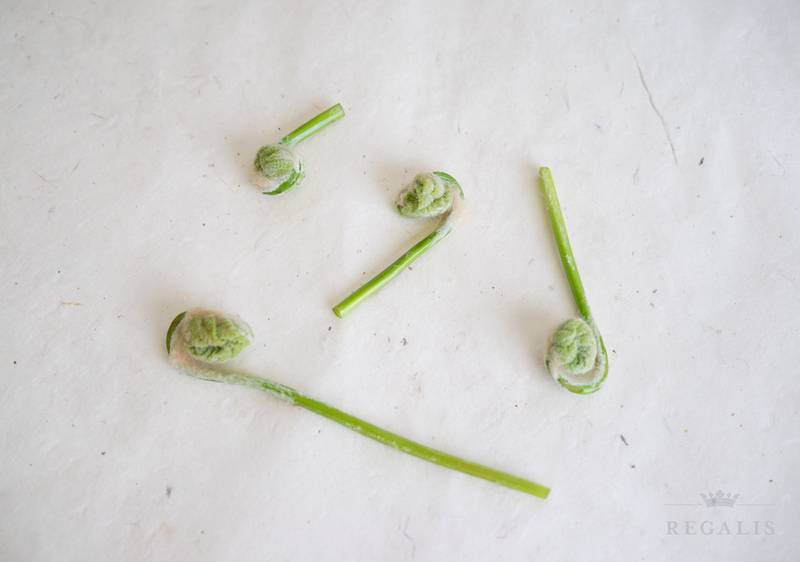 *Wild Angelica: The forest’s untamed answer to rhubarb. 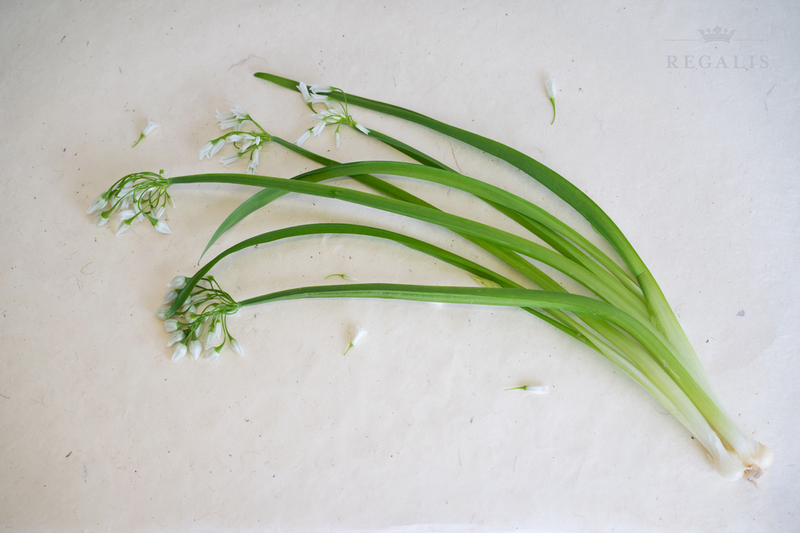 *Cat tail Shoot: A flavor profile crossed between zucchini and freshly cut cucumbers, the cat tail shoot is a refreshing and crisply textured wild edible that shines in the height of summertime. *Queen Ann’s Lace: Also referred to as the wild carrot, Queen Anne’s lace is the precursor to the modern carrot we all find at the grocery store. We harvest the first year roots of the Queen Ann’s lace, yielding a tender, wild flavored carrot like root. *Pin Cherries: Also known as the wild red cherry, this is a versatile fruit for baking, jellies, sauces and more. *Wild Fennel: The wild version of agriculturally grown fennel, the vibrant anise flavor is intensified in the wild. *Sassafras Root: Foraged in the woods of Arkansas, our sassafras root can be used over and over, steeped in tea, transformed into syrup for root beer, or chew on the root to freshen your breath.